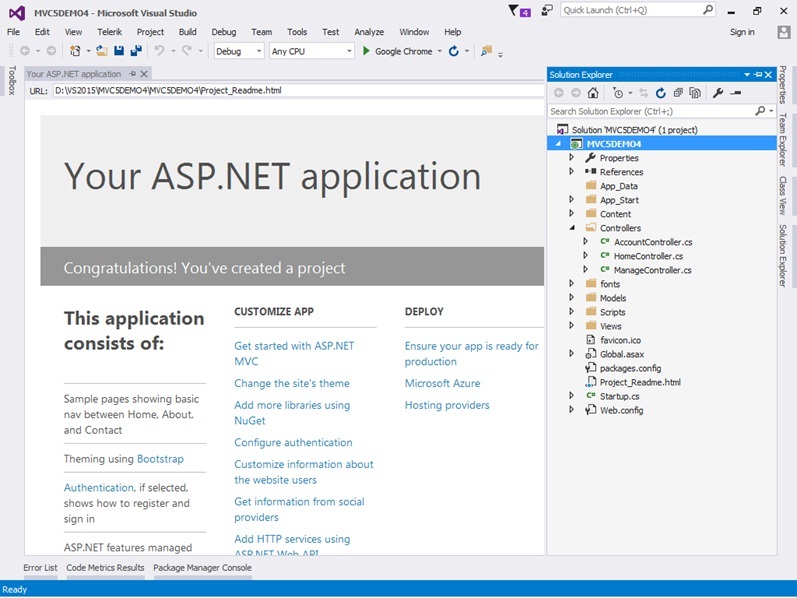 In this Article, we are going to learn how to implement Microsoft OAuth service with ASP.NET MVC 5 application. The process of each OAuth provider is different as we saw on Facebook, the Facebook provide appId and appSecret and in same way Google provide ClientId and ClientSecret along with that Twitter provide Consumer Key and Consumer Secret but the way you need to register you application for using this services are totally different from each other, In this fast growing world most of application requires this kind of Authentication technology. 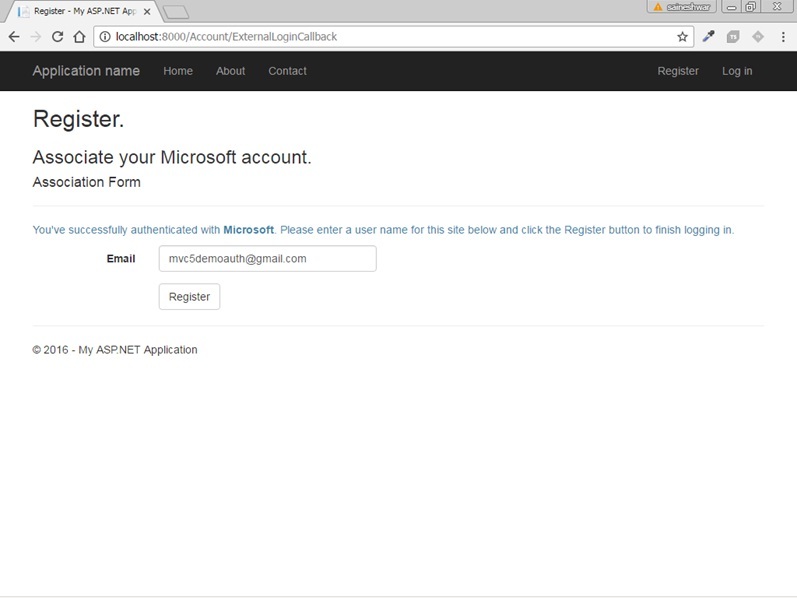 Let's start OAuth with Microsoft in step by step process. 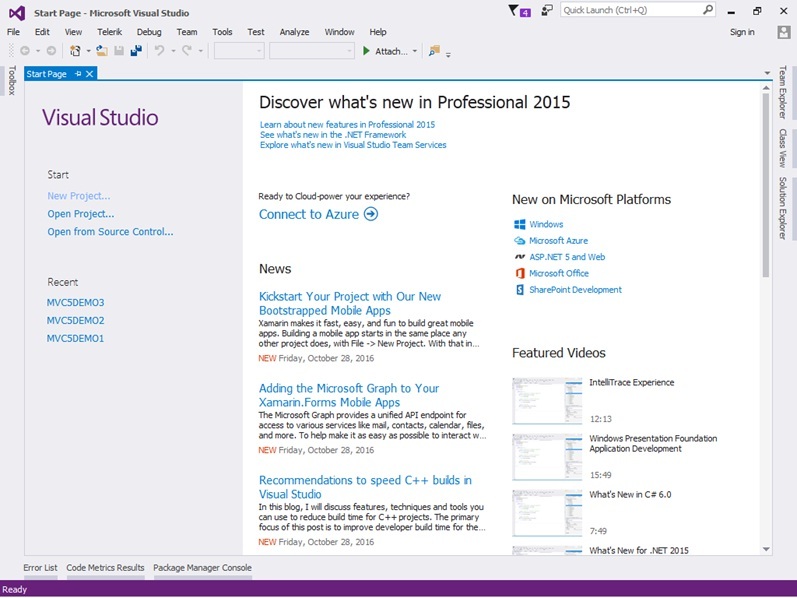 From Visual studio 2015 IDE Start page click on "New Project" link. After clicking on "New Project" link a new dialog will pop up. 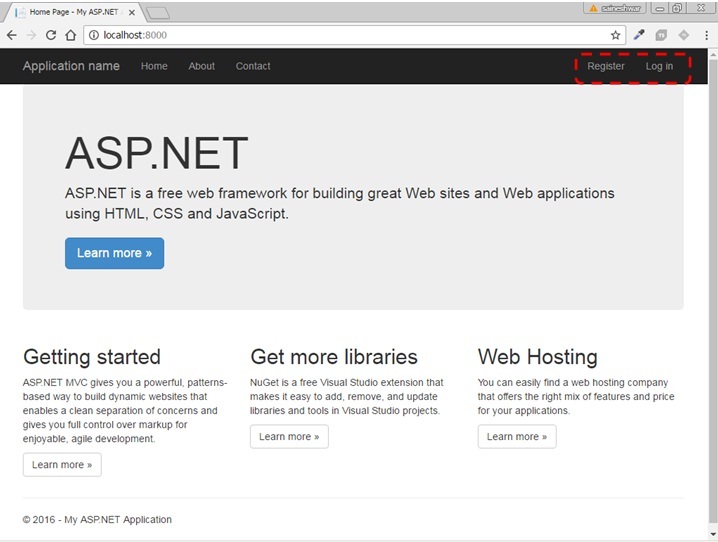 In that we are going to select web templates from left pane after selecting web template, we find only one project template in it "ASP.NET Web Application" just select that. 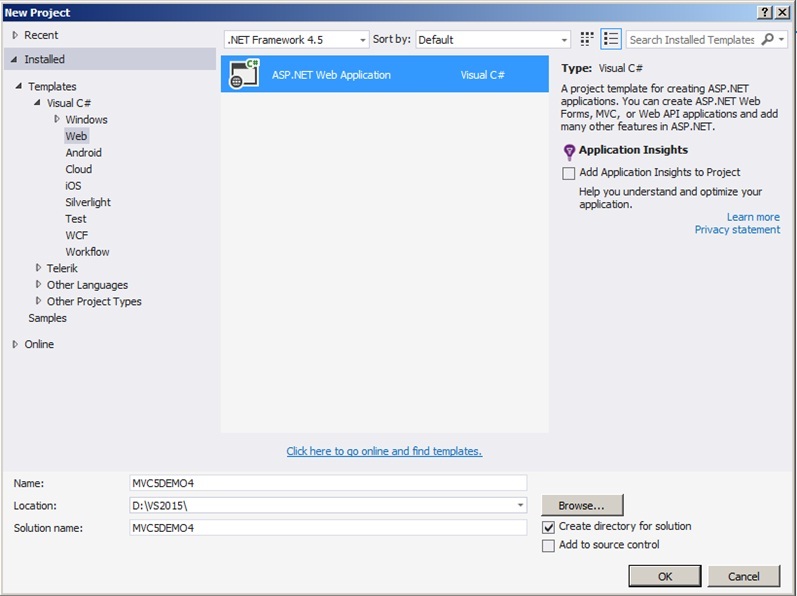 After selecting this project template next we are going to name the project as "MVC5DEMO4" and clicking on the OK button a new dialog will pop up with Name "New ASP.NET Project" for selecting project Templates. 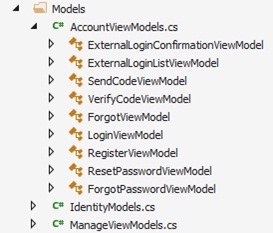 In this dialog, we are going to choose MVC project template and then we are going to choose Authentication type for doing that just click on Change Authentication button, a new dialog will pop up with name "Change Authentication" here we are going to choose Individual User Accounts . 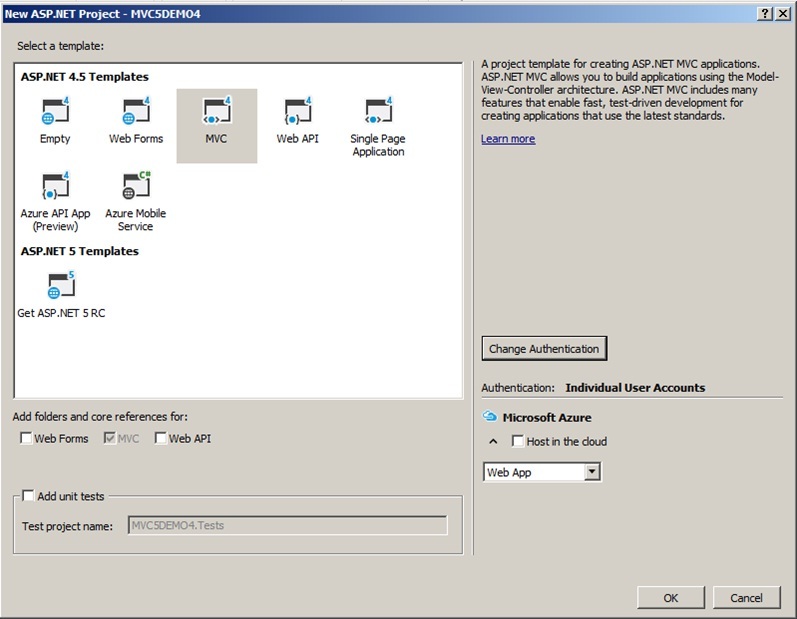 If you choose this option for Authentication of application then your application will be configured to use ASP.NET identity [ASP.NET Membership] where User register in the application and then sign in using credentials and also User sign in via social accounts such as Facebook, Twitter, Google, Microsoft and other providers. 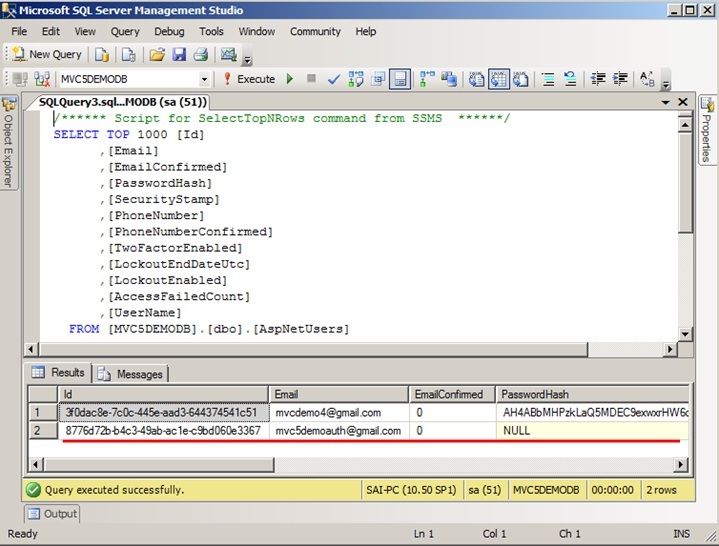 All user data will be stored in SQL server database. After selecting Authentication type as Individual User Accounts click on OK Button. It will show a progress bar while it is creating a project. 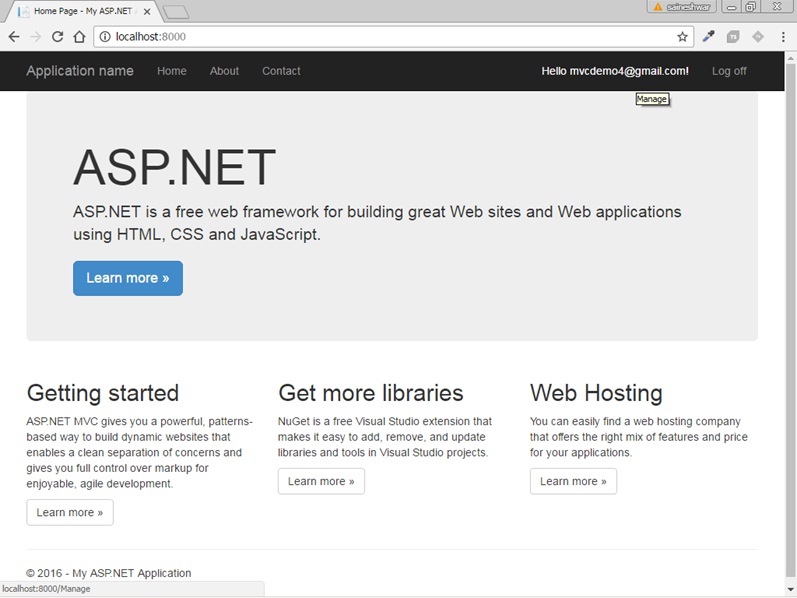 After creating a project it will show Readme HTML page with useful links on that page. And in right part, you will see newly created project structure. As we have chosen Individual User Accounts Authentication type we got ready made Membership Model added in Models folder as shown below. After adding Connection string next step just save current project and RUN. After Register page appear enter details required for registration. After filling data just click on Register button meanwhile Microsoft.AspNet.Identity will generate tables in the database as shown below. Along with this, it will also save data in these tables. Just have a look on below snapshot it is data which we have filled while we have registered in the application. If you look out properly you will as see other tables in the database which stored data related to Role and Role. AspNetUserRoles: - which stored data related to Role assigns to User. AspNetUsers: - which stored data related to User. 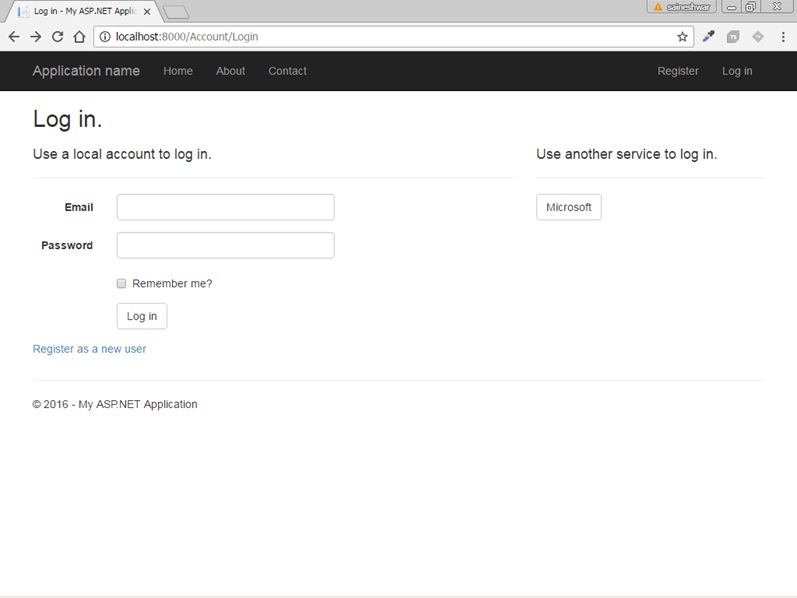 AspNetUserLogins: - which stored data related to Login Provider [Google, Facebook, Twitter] [ProviderKey, UserId]. Now you are logged into application if you want you can log out and retry to log in. It is the traditional way to doing it. 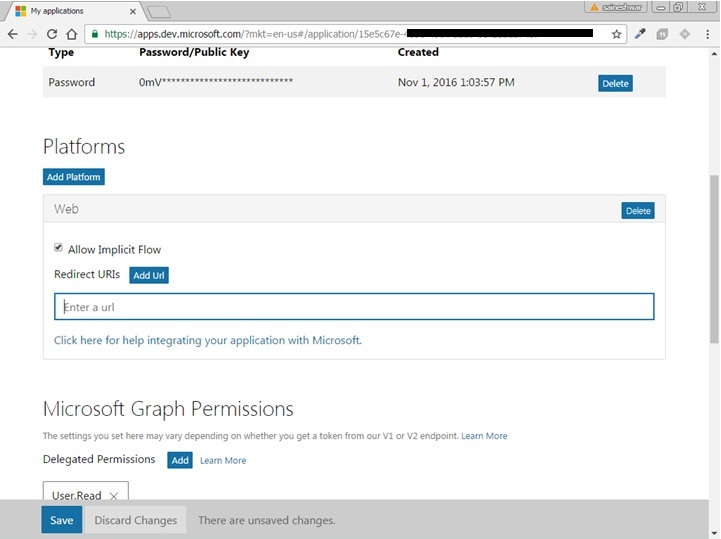 Now let move toward Implementing External Authentication provider like Microsoft. 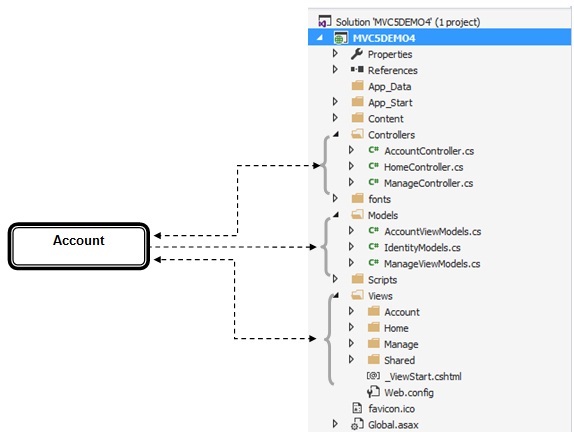 In this part of implementation, we do not require to do any coding part it's all about configuration. 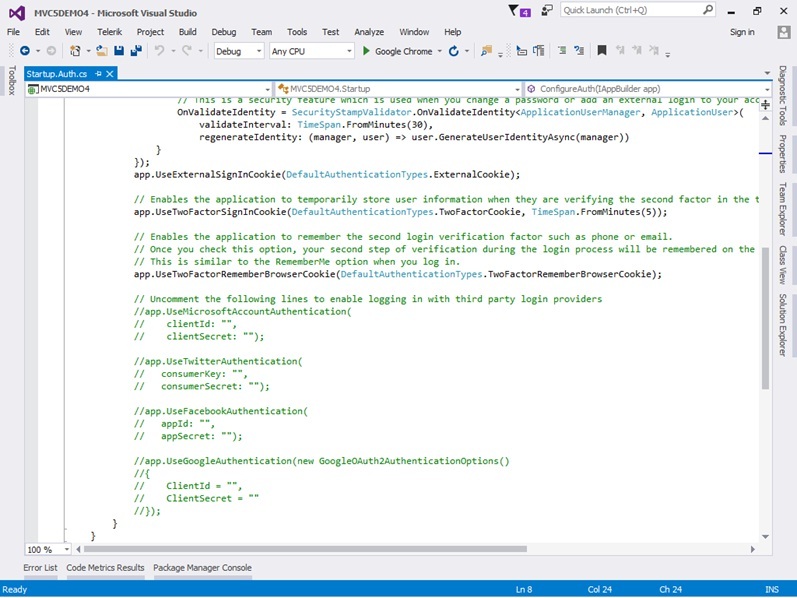 Now let's take a view on Startup.Auth.cs file and see what it contains. 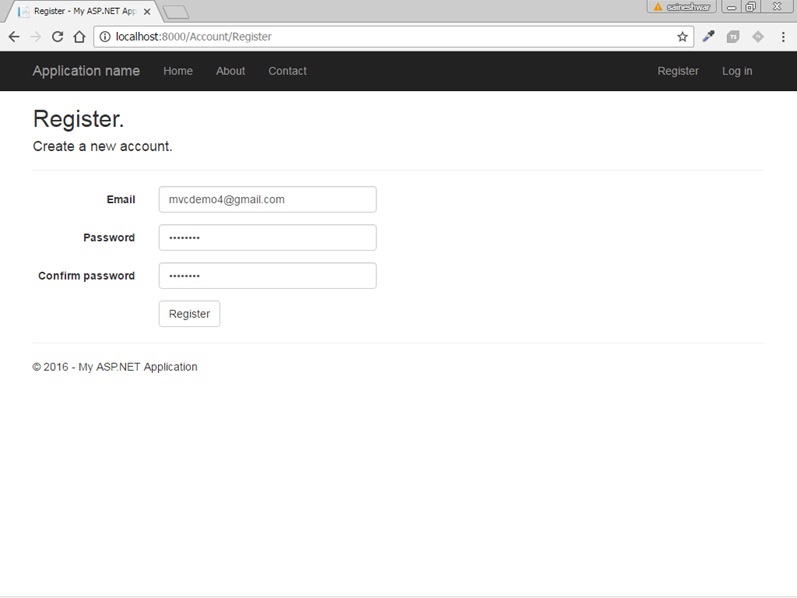 The Startup.Auth.cs file contains all OAuth Clients comment by default. We are going to implement an example of OAuth with Twitter for that we need to uncomment Twitter client first. 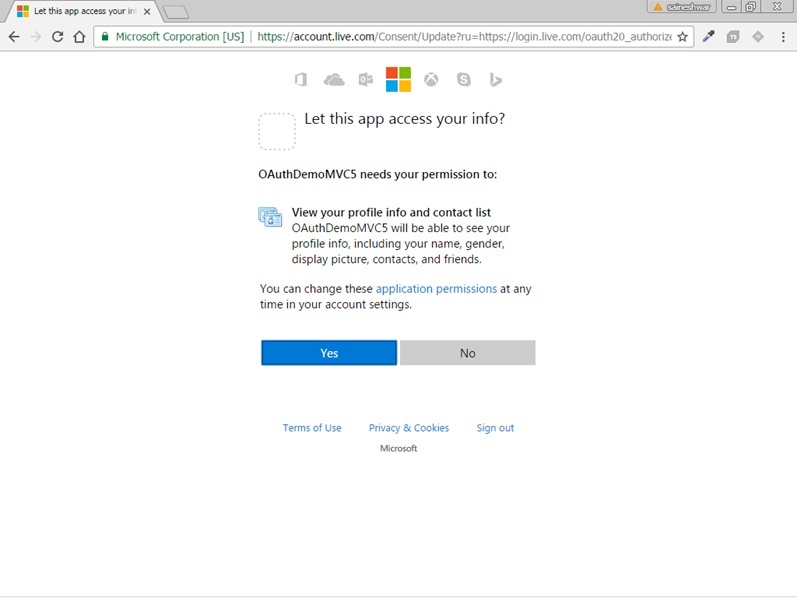 In this part we are going to register our application with Microsoft but for doing this process we need to have account on Microsoft if it is not there then we need to create account for this demo, if you already have Microsoft than that good you are ready to take ride just login into your Microsoft account past given URL: - https://apps.dev.microsoft.com/ , below view, must appear after pasting URL. 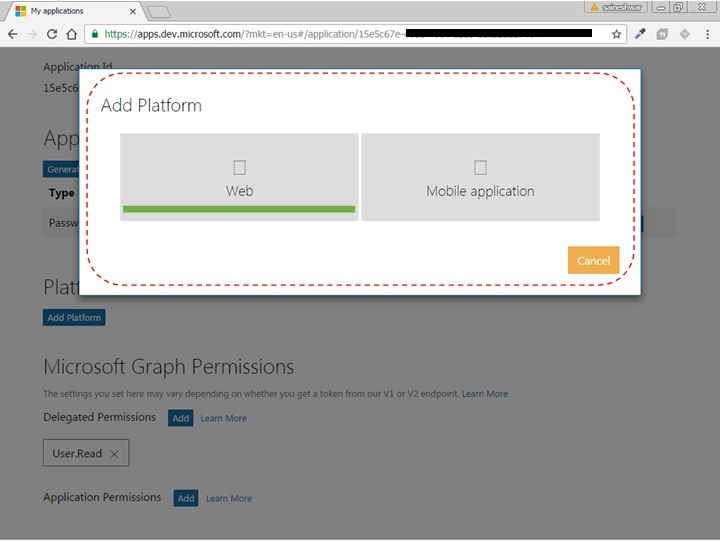 After logged into https://apps.dev.microsoft.com/ next step is to click on "Add an App" button as shown in above snapshot. 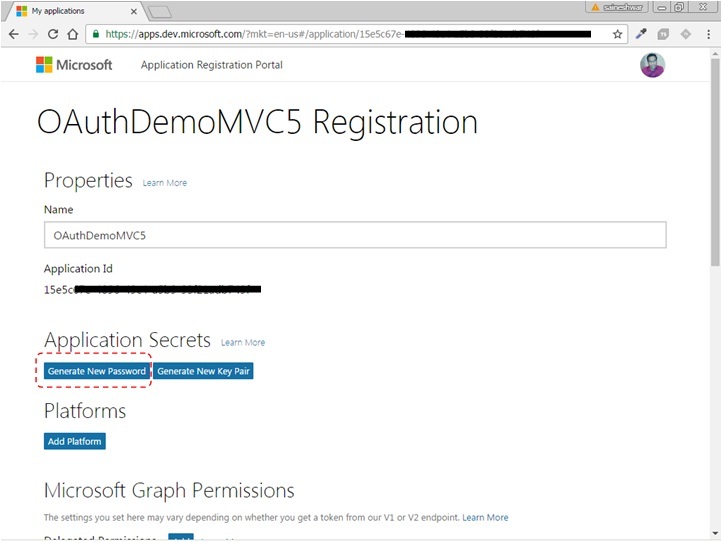 After clicking on Add an App button a pop up will pop up with Name "New Application Registration" asking for App Name here we are going to enter "OAuthDemoMVC5" and click on Create application button. 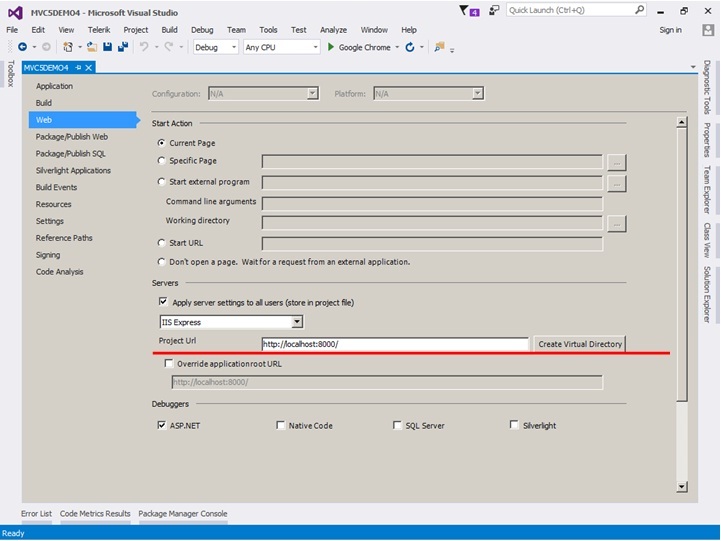 After click on Create application button, it will take few seconds for configuration as shown in below snapshot. 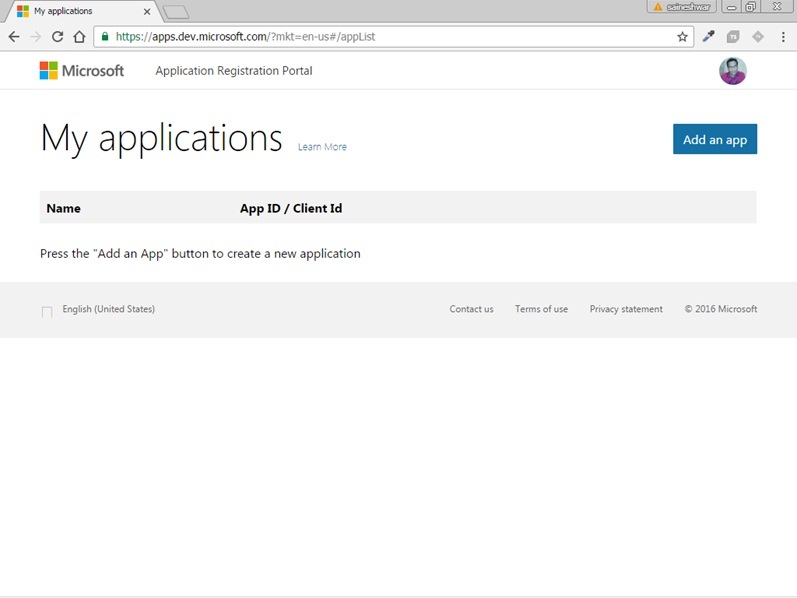 After processing it will show below view with Name of application you have provided along with that it will generate Application Id [clientId] which is clientId. Next step is to get ClientSecret for getting that just click on Generate New Password button. After getting ClientSecret now next thing which is remaining with us is to add platform. For adding Platform just click on Add Platform button, after that pop up will appear with name Add Platform in that we are going to choose The Web. After choosing The Web it will ask for Redirect URIs as shown in below snapshot. 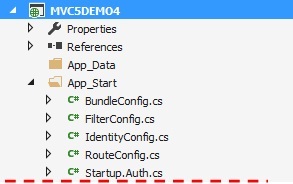 To add Redirect URIs just right click on MVC5DEMO4 project then select properties from the list which is at bottom. Finally, just click on save button to save all setting. 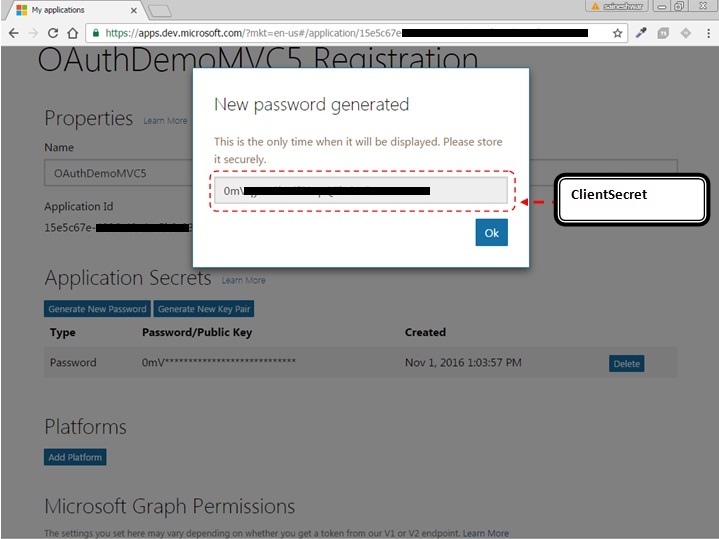 Just copy and paste ClientID and Client secret to Startup.Auth.cs class as shown below. Then Save your application and run. Below Login screen will appear with Microsoft button. 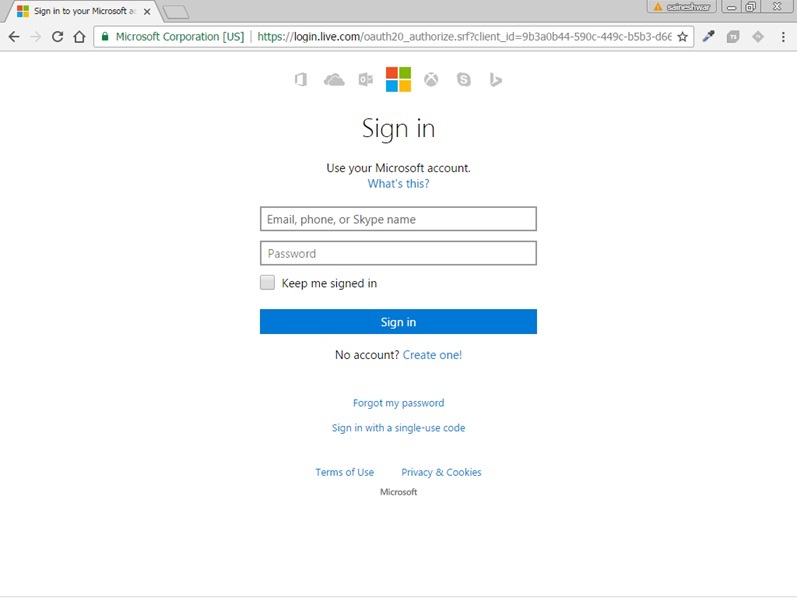 After clicking on Microsoft button it will take you to Microsoft Login page and ask you to enter credentials for Sign in. After entering credentials and clicked on Sign in button. 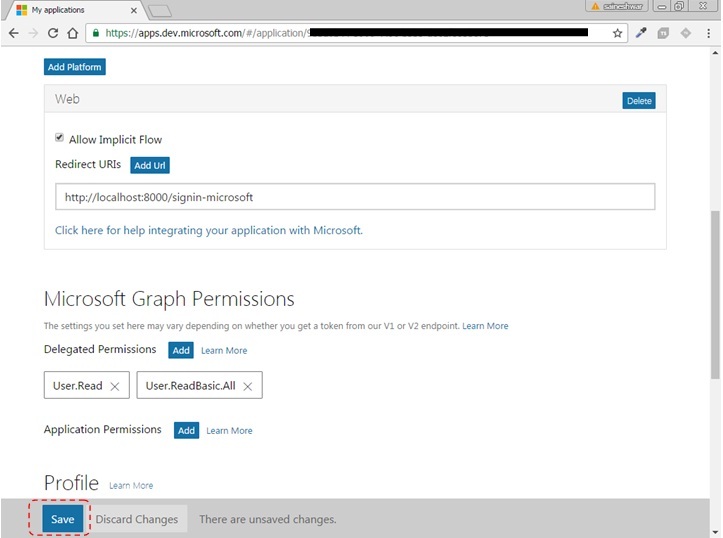 After clicking on Yes button, it will redirect to ExternalLoginCallback view and on that view it will show your Email ID of Microsoft from which we have logged in, and then finally click on register button. Along with that, it shows the message. "You've successfully authenticated with Microsoft. Please enter a user name for this site below and click the Register button to finish logging in." 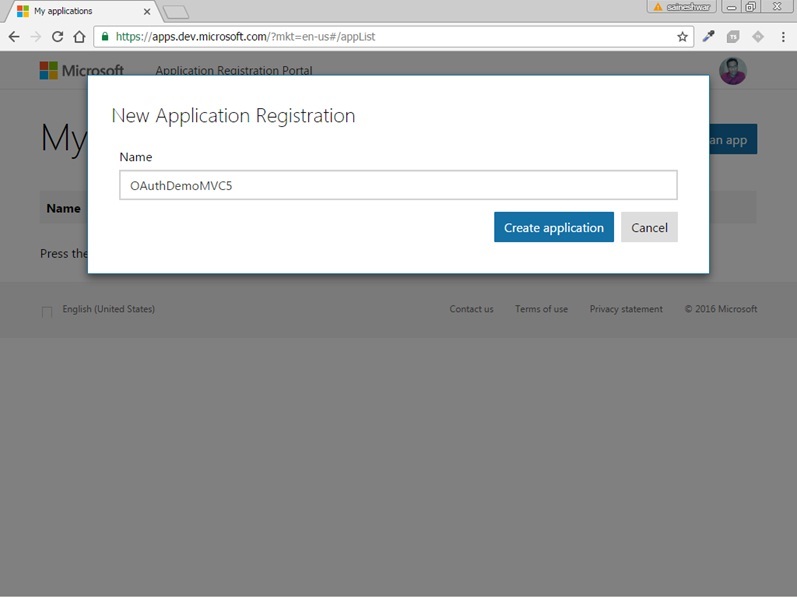 After clicking on Register button it will register you and along with that it also login into the application as shown below. 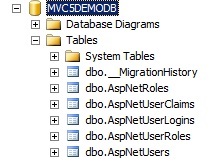 Now let's look at database tables what kind of data is been stored there after this process. 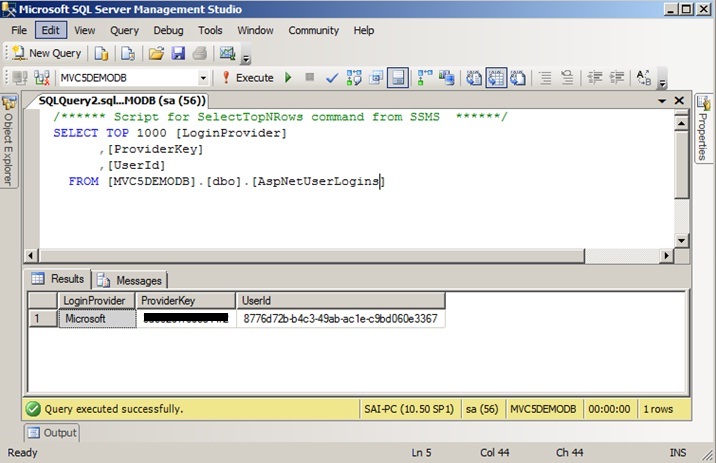 This table store data related to LoginProvider. 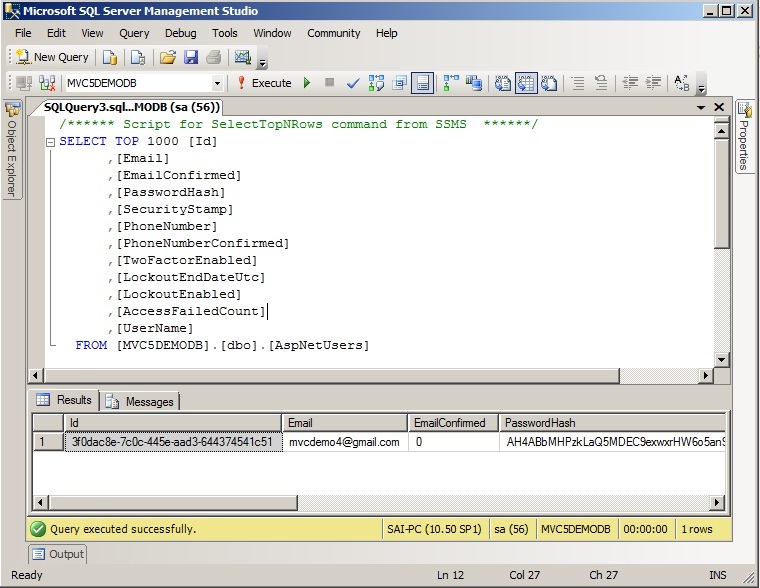 As you can see it is storing data of Microsoft login. This table store data related to all Users from Oauth login as well as from Traditional. If it contains PasswordHash then it is registered by Traditional Login and if it is PasswordHash is empty then it is done by OAuth login. 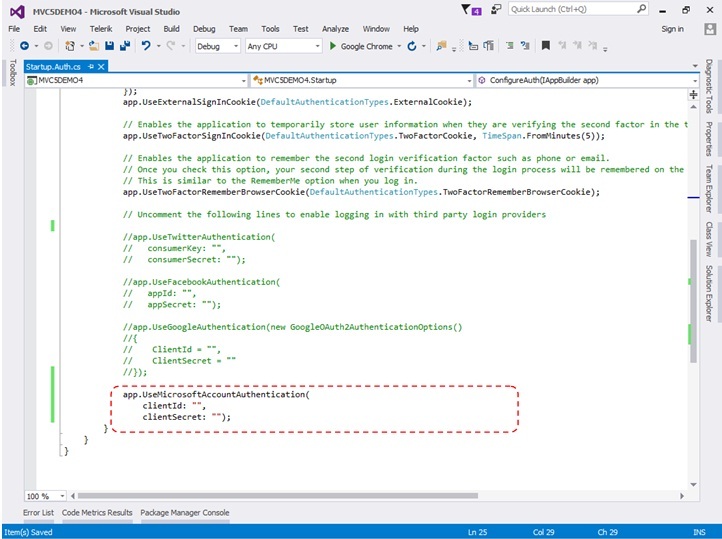 Finally, we completed understanding what OAuth is and how to use with asp.net MVC 5 applications and also had an example of OAuth integration with Microsoft. Copyright © 2017 Learn MVC Step By Step . All Rights Reserved. 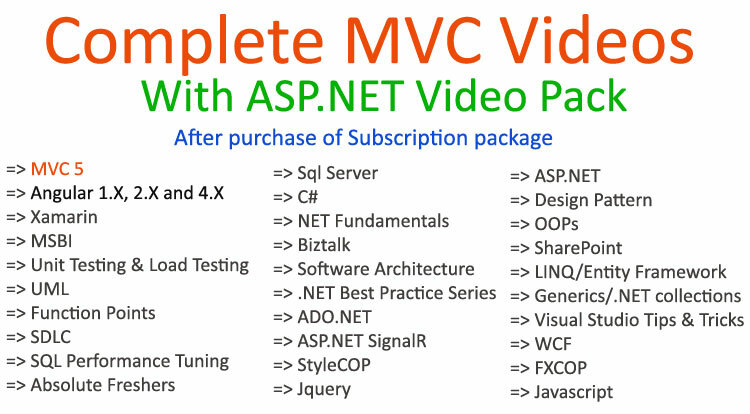 Get MVC/MVC 5 + .NET Videos Pack Order Now!! !